​ACTS is an acronym that stands for Adoration, Community, Theology and Service. It is a retreat format that was started in San Antonio, Texas and grew out of other retreat formats that already existed. It is centered on how we as Catholics can improve our relationship with God and build a better, stronger faith community. Through the ACTS retreat, ACTS Missions provide a spark that ignites Catholics world-wide with the eternal flame of the Holy Spirit. As an instrument of God, ACTS is a light that will help bring about the New Evangelization by fostering love and true discipleship, leading others to a commitment and obedience to Our Lord Jesus Christ by our every word, action and thought. The retreat begins on Thursday evening and ends the following Sunday at a Mass celebrated with the parish community. Retreats for men and retreats for women are given separately. Talks and activities during the retreat focus on Adoration, Community, Theology, and Service. Holy Scripture and the teachings of the Roman Catholic Church are the guides for the retreats. 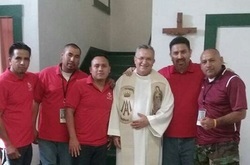 Each retreat is conducted by a retreat "team" composed of 20-30 individuals who have attended prior ACTS retreats. The team organizes the retreat, conducts the retreat talks and activities, and ministers to the needs of the retreatants during the retreat weekend. At IHM ACTS retreats are conducted both in English and Spanish for men and women separately.